A couple of weeks ago an Oscar-nominated short hit the internet and has since become a viral sensation. 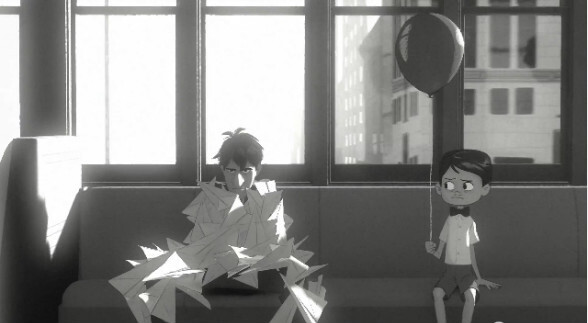 The short is “Paperman” by Disney, and as I recently tweeted, it’s one of the most engaging and delightful shorts I’ve seen in a long, long time. @DareDreamerMag Paperman had me 100% until… Well, no spoilers, but you know. Still fun, but lost some of the charm for me. That started a back-and-forth tweet conversation we continued via email so as not to publicize any spoilers. Speaking of spoilers, if you haven’t seen it yet, take six minutes and watch it now before reading on. Up to the point when the airplanes came to life, I felt for the guy. I WANTED him to throw that airplane through the window. I was thrilled by his plan to use an airplane in the first place…After the movie, I thought about why I felt a little let down. I think it is because the MAGIC became too literal. It became less about possibility and hope and more about, hey, magic airplanes. Frankly, I felt that way too at first. There was a tiny part of me the felt betrayed. Like the writers copped out of coming up with non-magical solution that would cleverly bring the two potential lovebirds together. But then something happened for me. I was “carried away” by those whimsical planes, pretty much just as the hero in the story was. I found my heart racing and my face smiling as they all worked together to bring the boy and girl together. And here’s why. In every good film, every shot, every sound and every special effect has a purpose. Nothing is taken for granted. There’s a shot in “Paperman” which gives a clue as to why the film works for me, and why I think that as of this writing it has racked up over 12 million views in fewer than two weeks. It’s the shot with the boy and the balloon. Why did the animators put a balloon in the boy’s hand? The joke could have easily worked without a balloon. Why not a lollipop. That might have even been funnier. The boy could be eating the lollipop then stops in mid-lick to see this strange man covered in paper airplanes. But why a balloon? I think that shot is a clear homage to the 1956 French short film “The Red Balloon.” The film not only won the Palm d’Or for short films at Cannes that year, but it won it’s writer/director, Albert Lamorisse, the Oscar for best screenplay. I, like many of my contemporaries, first saw that film in elementary school and it carried me away just like this film did. In case you’ve never seen it, it’s the story of a “living” red balloon that befriends a little boy. If you’ve never seen it, I won’t spoil it for you. Without giving too much away, at the end of the story, all the balloons in Paris come alive and whisk the little boy away. The reason why they do is the part I don’t want to spoil. I found a copy on YouTube that was posted two years ago (see below). Hopefully, it’ll be around for good. Take a half-hour break and watch this film. I promise you won’t be sorry). What worked for me in “Red Balloon” worked for me here. The personality of the planes won me over. In BALLOON there is an established relationship between the boy and the balloon from the start of the movie, and the balloon’s anthropomorphism is taken for granted throughout. In PAPERMAN, there is no indication or evidence that the airplanes are sentient or magical until, suddenly, they ARE. Why? Why NOW? Why not, when the guy spent most of a day and probably lost his job trying to meet this woman again, could the last airplane have not simply adjusted course to go through the window? I’ll grant you that. But I would argue that the planes come to life because they need to come to life to bring these two together. Call me a romantic, but love IS magical. It takes a miracle sometimes to make it happen. I’m not going to worry about all the logistical and realistic things the guy could’ve done to meet the girl. I’ve seen other comments about that and to me they miss the point. It’s a cartoon for crying out loud. 🙂 Yes, he could have just gotten up and walked over. But who wants to see that? The writers probably could have come up with a clever, more realistic ending to this film. Something that would have made you say, “Awww. That was cute.” But I don’t know that it would have been as grand. And I doubt it would have garnered the number of views it has. The end sequence with the planes and the music and the cross-cutting between the girl and the boy are riveting. They take you on an adventure. A magical, magnificent adventure that ends with two people coming together and falling in love. In every human heart, that’s what we want. Romance and adventure. In times like these, we don’t need more reality. Jamie, I would invite you to watch “Paperman” again with different eyes. Give yourself permission to be captivated by the story and the magic. Forget all the “why’s” and “wherefores”, and just go with it. Take on the heart of a child and, like the boy in “Balloon” and the Paperman here, be carried away. In the meantime, take a break from work, avoid your boss, and go watch “The Red Balloon”. Perhaps we all need a little magic to make that connection. The collective mind of the paper airplanes puts me in mind of the Robert Heinlein story “Our Fair City” that featured a mischievous whirlwind that kept treasures in nooks and crannies around the city. Alll in all, I liked the short. I too was let down when the magic became so literal, but the ending carried me away! I still have that twinge of “if only,” but maybe I’ll understand it better after watching The Red Balloon.